Preheat oven to 160°C (or 140°C for fan forced ovens). Place cashews on a baking tray and roast them for 4 minutes. Remove from oven and cool. Blend the dates and cashews. Place into a bowl. Add the remaining ingredients and blitz in blender. Using a tablespoon, measure out each ball and use your hands to roll into balls. Roll in cocoa powder and place in fridge for 20 minutes before eating. 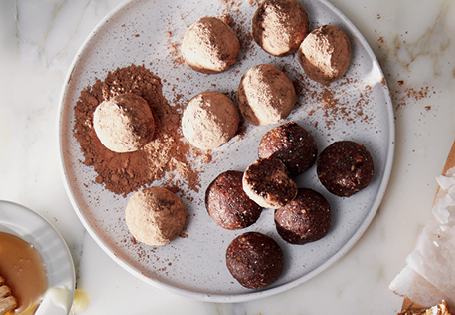 TIP: Try rolling half of the balls into desiccated coconut and the other half in cocoa powder.